There are six new slates introduced today – the Android-powered HP Pro Slate 12, Pro Slate 10 EE G1 and Pro Slate 8, joining the Windows-running HP Pro Tablet 408, Pro Tablet 10 EE G1 and Elite X2 1011. The highlight of the event was the 12-inch HP Pro Slate 12, which looks like a gigantic version of the HTC One. It packs a 12.3″ 1600 x 1200 px display and runs on Snapdragon 800 chip with 2GB of RAM. There is stylus support and dedicated stylus slot, but the pen is sold separately. It runs on mostly vanilla Android KitKat enhanced by some HP custom pre-installed apps, including stylus-oriented ones. We spent a few moments with the HP Pro Slate 12 and it is indeed very well built – a metal unibody just like the HTC One. The 4:3 screen ration isn’t everyone’s cup of tea, but those that value reading convenience over video watching still prefer their slates to pack more squarish displays. The resolution is subpar though as is the picture quality. The Pro Slate 12 runs very Android KitKat very smoothly and there is a dedicated app for painting or taking notes. It can be yours for $569. The HP Pro Slate 8 utilizes a 7.9″ display of 2048 x 1536 resolution, better than the Slate 12′s. The Pro Slate 8 also mimics the HTC One design and bets on a metal unibody construction. It also runs on Snapdragon 800 chipset with 2GB RAM and Android KitKat is in charge of operations. Quite expectedly, we liked the HP Pro Slate 8 design and build quality. The display ppi is better this time, so we had no issues with the picture quality. The Slate 8 also comes with stylus in mind, provides support and built-in pen slot, but once again – you have to purchase it separately. The retail price is $449. Finally, the HP Pro Slate 10 EE G1 with optional Keyboard Dock, designed to help students in the class rooms. 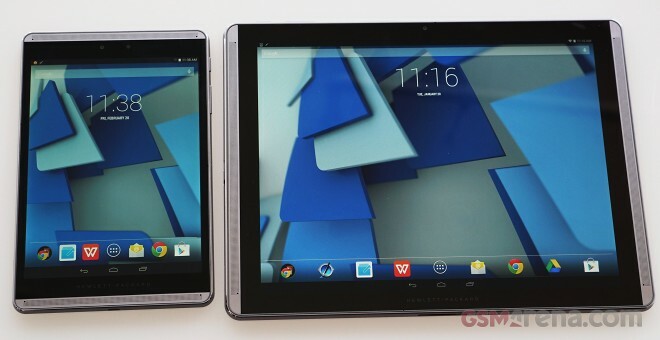 The specs include a 10.1″ 1280 x 800 px display, Intel Atom processor at 1.3GHz, 1GB of RAM and Android KitKat OS. You bet there is a stylus support, too. The detachable keyboard dock features a mouse trackpad. Docked or not, the Pro Slate 10 EE is a bulky and heavy device with unimpressive build quality. Of course, it’s cheaper compared to the other Pro Slates at just $279. The 10″ educational tablet has a Window-powered edition called HP Pro Tablet 10 EE G1 with the same specs and it costs $299. HP also announced two more Windows-powered devices – the 8″ Pro Tablet 408 and the business-grade Elite x2 1011. The Pro Tablet 408 packs an 8″ 1280 x 800 px display and runs on a 1.3GHz Intel Atom CPU with 2GB of RAM. The OS is Windows 8.1 and the price is $299. The 8″ tablet is compact and easy to handle, with pleasant built. Finally, the HP Elite x2 1011 is an 11.6″ tablet with a detachable backlit keyboard. The device is offered in different configurations with Core M processors, at least 4GB of RAM, 128GB SSD and 1366 x 768 or 1920 x 1080 display. The keyboard dock extends the total battery capacity with 21WHr, up to 54WHr. Both the slate and the keyboard are of an excellent metallic build and we really like those lately. They are sleek, light and useful and we bet many people will like them. The combo will be available later in January, starting at $899.